i am miranda. i will be 6 yrs old next month (aug) and i melted my moms heart at 4 months old. i go to work as a service dog for my grammy who is disabled. when mom has free time we are bonded at the hip and we go to the park to have time with my friends. i live with 1 cat who would like to see me leave but she loves too... i think mommy shares her bed with me, or is it the other way around?? im spoiled rotten but i cant ask for a better human friend then my devoted mom. She also volunteers for the san diego german shepherd rescue. 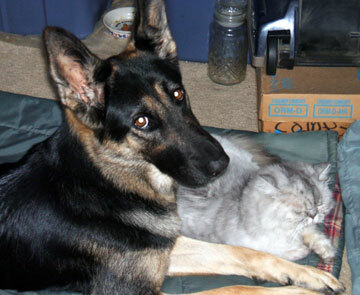 she tells me that some gsd's r not as fortunate as i am and they need love too to lift their spirits. mom give me plenty of love so i dont mind, gives me an excuse to stretch out on my bed. What a BEAUTIFUL girl you have! Miranda is a lucky girl to have a good home with a loving mom and a cat to spare. Take care.